Before packaging, make your item identifiable to other players by giving it a display name. This name will show up in game menus. Find your weapon Blueprint asset (TutorialWeapon01) in the Content Browser and open it. Your weapon now has a name that will show up in game menus. Sharing automatically packages your assets. You then have an option to share publicly, but you do not have to. If you do not, you can still use your packages assets in an offline game. If you do share publicly, your assets will be visible to anyone who join your game. In the Level Editor tab select the Share drop down, and choose Share a Weapon. Choose TutorialWeapon01 from the pop-up menu. This packages asset and all its dependencies into a .pak file. While the process is running, you will see a Packaging Weapon... notification in the lower right of your screen. When packaging is complete, you will have an option to share publicly. Yes means your assets can be enjoyed by anyone who joins your server. No means the packaged assets are available for your use offline. Play a Game with Your Weapon! To play a round on your weapon, select Play → Create Game. Select the Weapon Replacement mutator and use the "→" to add it to the active mutator list. 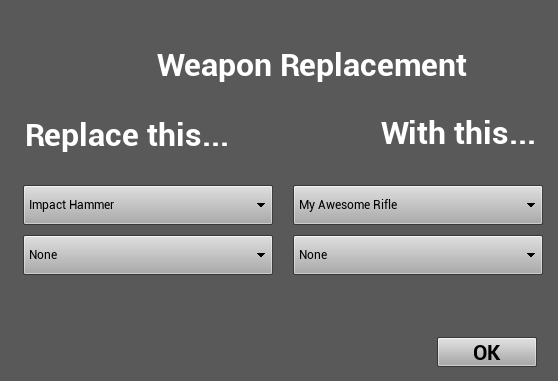 Click on Configure Mutator to pick which weapons should be replaced with your weapon. Pick the weapon to replace on the left. You should see your weapon appear in the combo box on the right. We are still working out some kinks in the process; it may not work depending on your setup. Find your weapon Blueprint asset (TutorialHat01) in the Content Browser and open it. Your item now has a name that will show up in game menus. In the Level Editor tab select the Share drop down, and choose Share a Cosmetic Item. Choose TutorialHat01 from the pop-up menu. This packages asset and all its dependencies into a .pak file. While the process is running, you will see a Packaging Cosmetic Item... notification in the lower right of your screen. Play a Game with Your Cosmetic Item! 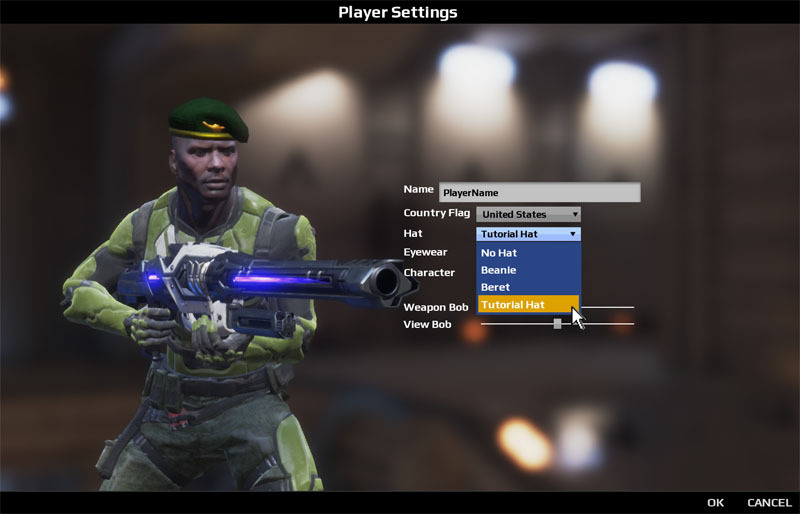 To use your hat in game, select Player Settings from the gear menu. Select your cosmetic item in the Hat combo box. Press J to taunt with your hat during a match. Before packaging, make your map identifiable to other players by giving it an appropriate file name, description, and author. Click on File → Open Level to open a map for packaging. Search for the map you want to package (e.g. 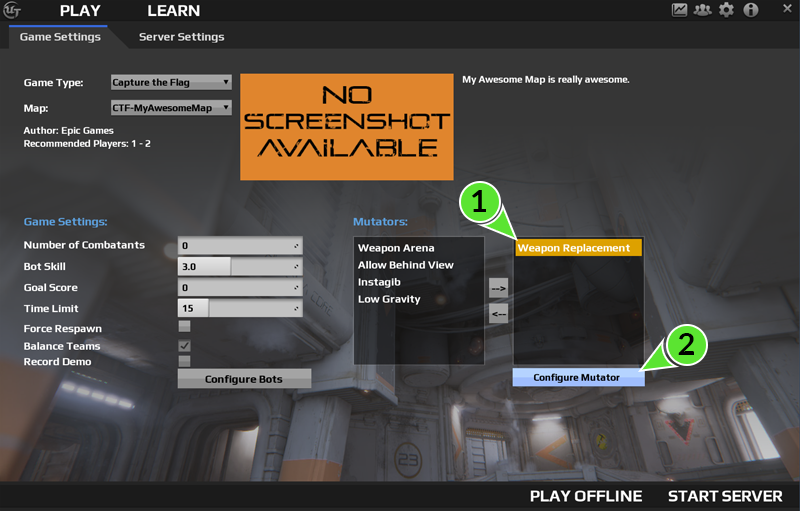 levelTutorialMap) and double-click to open it. If your map does not meet the above naming and location criteria, save the map with an appropriate name by using File → Save As. 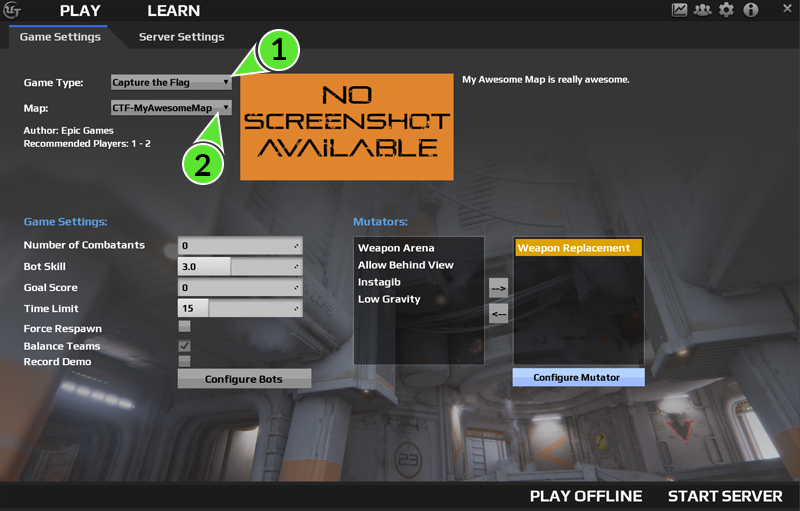 Your map will appear in the game menus with the name you provided once you have packaged it. 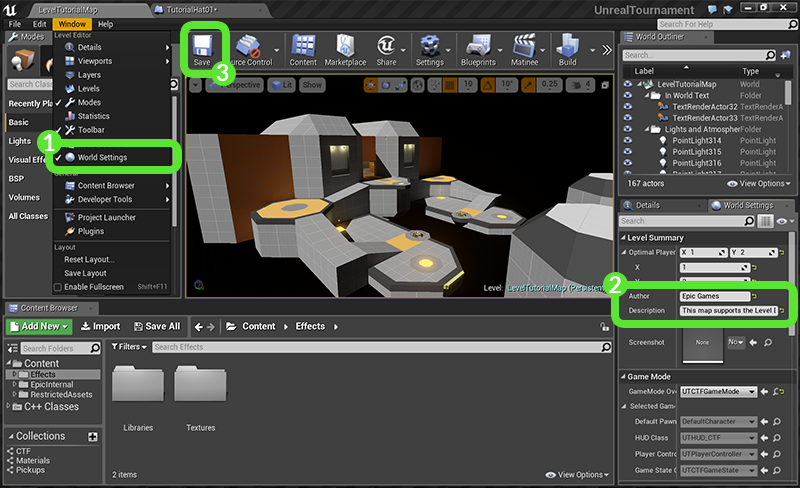 In the Level Editor tab select the Share drop down, and choose Share a Level. While the process is running, you will see a Packaging Level... notification in the lower right of your screen. To play a round on your map, select Play → Create Game. Then choose CTF or Deathmatch from the Game Type combo box. Click on the combo box labeled Map and select your map from the list.